As I've mentioned in the last couple of posts, I'm working on putting together an online shop to be part of the blog. I'll carry a collection of my "everyday essentials" like the parchment paper sheets, cellophane bags, custom labels and stationery. I'm also planning to stock "everyday entertaining" items like hemstitch linens and candles. The products I've ordered are elegant enough for special occasions, but can (and should!) be for everyday use. I've been working on my collection of color swatches that my products will feature. You'll be able to order embroidered linens, stationery, candles & custom labels in coordinating colors to compliment your home or the season. I've gotta say - designing the color collection was the best part so far. I received the coordinating collection of candles yesterday and the colors were so stunning - soft and sophisticated colors (even the bright ones). Here is what I have so far... what do you think? Am I missing your favorite? The store will be launching in just a couple of weeks - I can't wait for you to see what I have collected! This is one of our favorite summer suppers. I use heirloom tomatoes when I can find them... mine still have a good 30 days before they'll be ready in my raised bed garden. They are worth the extra money and hunt - the flavor and smooth texture is incomparable to a regular grocery store tomato. I cook bacon by baking it in the oven at 325 degrees for 15-20 minutes. It works great if you cook them on a baking rack on a baking sheet, so the fat can drain. Spread each slice with mayonnaise, then tomatoes + sea salt & pepper. Next, add bacon then avocados. The best way to bake bacon! Final product. 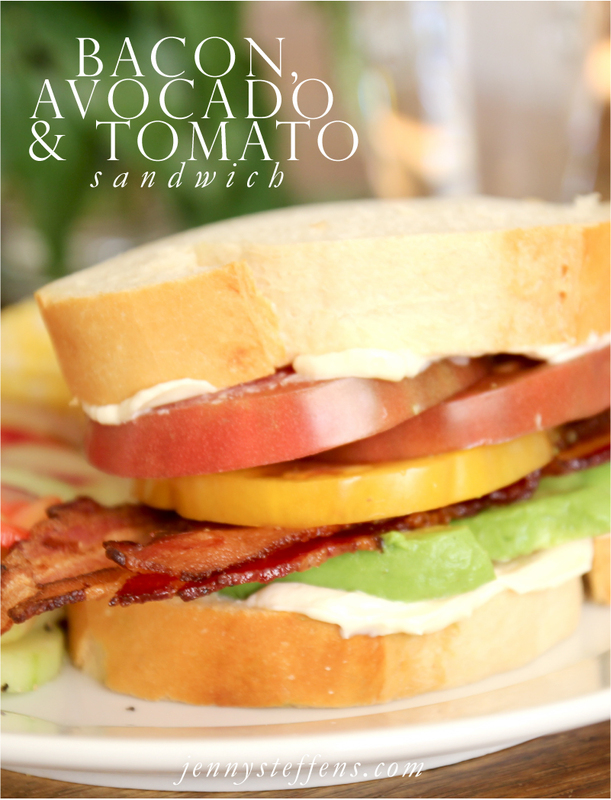 Creamy avocado, sweet juicy tomatoes, and crispy salty bacon. As I said, the best summer supper. Emma's not quite ready for bacon sandwiches yet, so I made her Tomato & Avocado Flowers. "May-toes" as Emma calls them. She was entertained for at least 30 seconds, I think. 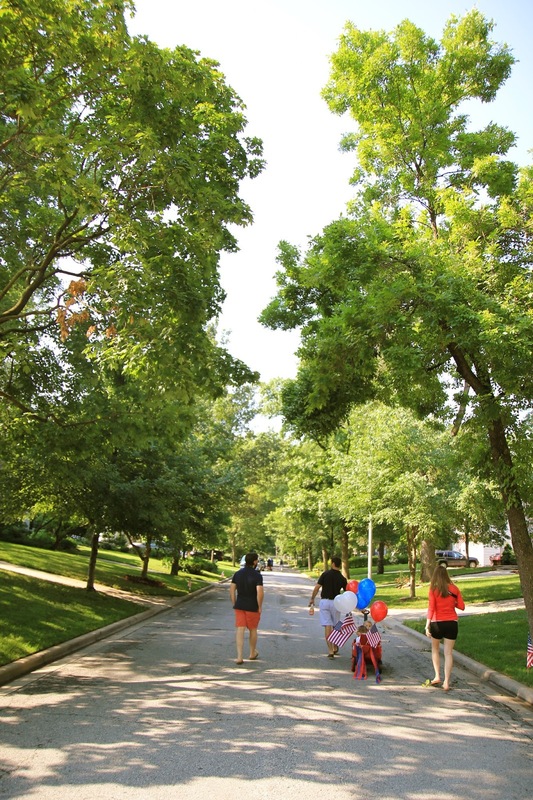 When we moved to Fairway (the first time, 5 years ago before our adventures in New England), I loved watching the 4th of July Bike & Trike Parade from our back yard. I thought it was so quintessential "charming town" - one of the reasons I love this area. When it was time to move back from Concord, Ma. I knew I wanted to buy another house in Fairway - I couldn't wait for Emma to grow up on these old tree lined streets of charming cottage-type homes. One of our couple friends from college (who also did a stint in New England - Maine, to be exact) also picked Fairway as their new home just this year... and they have a daughter one month older than Emma. They joined us as wagon buddies for the parade and for a donut decorating breakfast before. Fluffy Fresh Donuts - best in KC so far... We've been doing a Saturday morning donut tour the last couple of weeks. Patriotic themed fruit, of course. A little flag twirling fun. And now you know how our family room looks most of the time! The kitchen runeth over. Handmade star wands for the girls made by our wagon buddies. Heading down to the parade route. I love how festively dressed everyone is! The girls didn't last long in the wagon... In fact, we brought up the tail of the parade with some running. And a good old fashioned Daddy shoulder ride. It was Emma's first of many visits and the perfect spot to let her run after 2 hours in the car. We plan to share these photos with her in 17 years... when she is a freshman! 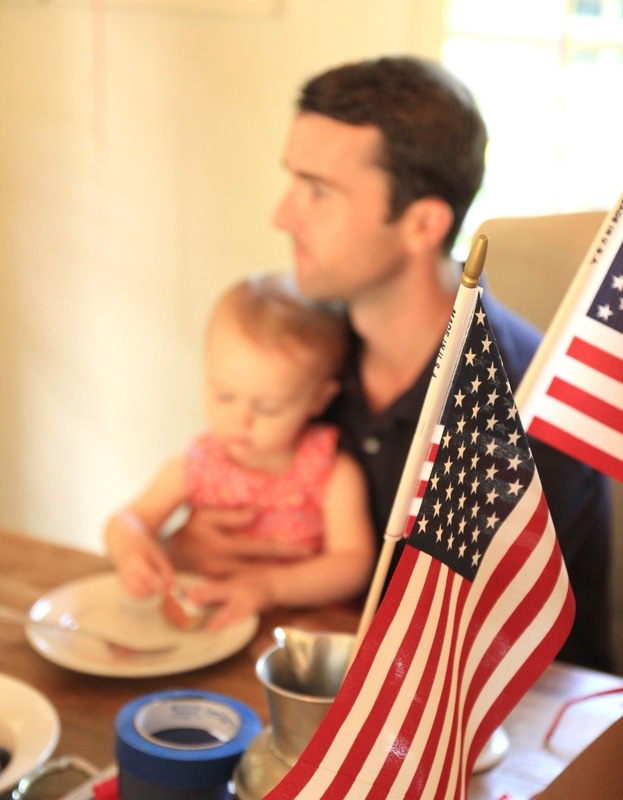 Stay tuned - tomorrow I'll post photos the 4th of July shrimp boil we attended at Jill's house! "Your biggest fear should not be failing. It should be succeeding at things that don't matter." It made me stop and think - is what I do something that matters? Though I feel like I do try to share with you, my readers, a "real" reflection of our life, I love to get reminders like these that keep me on track. 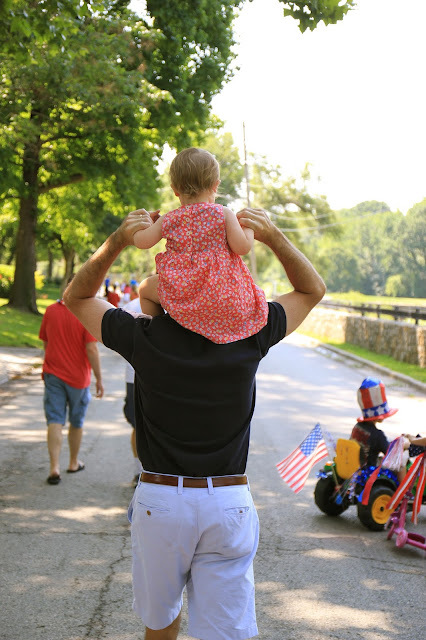 Since Emma was born, it has been my goal to transform this blog from a picture perfect "magazine-type" blog to a genuine reflection of a life well-lived. I share with you my life - in the form of recipes, family photos, home projects and travels, in hopes of inspiring you to live a full life. Sometimes I run into people that say, "Oh, you're a blogger? I don't read blogs because they just make me feel bad about myself and my home!" Ugh. I want people to feel empowered by my blog. I love that it is my "job" to inspire others to live well through their own efforts. What I write about might not be life-saving, but sometimes having a new and interesting recipe to make for dinner or a tidy linen closet can definitely be a day-saver. So many times the little things mean so much - the daily struggle of refusing to become overwhelmed by the clutter, the stress, the finances, the laundry... it can all add up to feeling underwater all of the time. Especially when it seems that everyone on Insta and Facebook has more than enough time, energy, money and patience. I feel you. Peeping into others lives can make you feel sub-par - unless you're looking at the right things. I hope this blog is place you can come to glimpse into our home and find peace in your own home. I'll be returning tomorrow from our little break with some new recipes and projects - and a recap of our festive fourth! Another re-post from last year - one of my favorites! 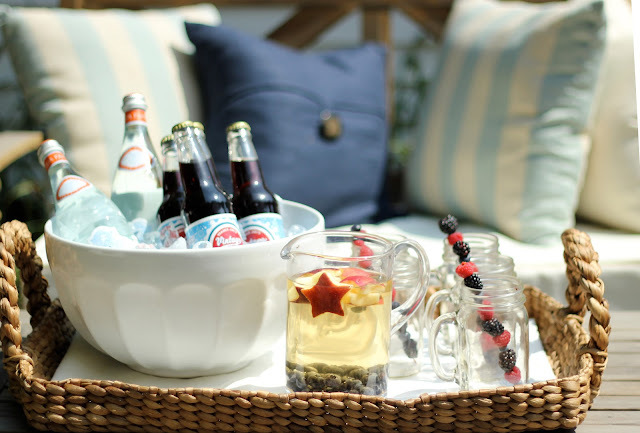 Sangria is one of my favorite Summer drinks... wait, is it that obvious? Yes, this is my second Sangria post of the Summer. This version was created especially for TheDaily.com for our 4th of July DIY Entertaining video. To see the video, more details and recipes (including a Red, White & Blueberry Ice Cream Cake) from the shoot, click here! 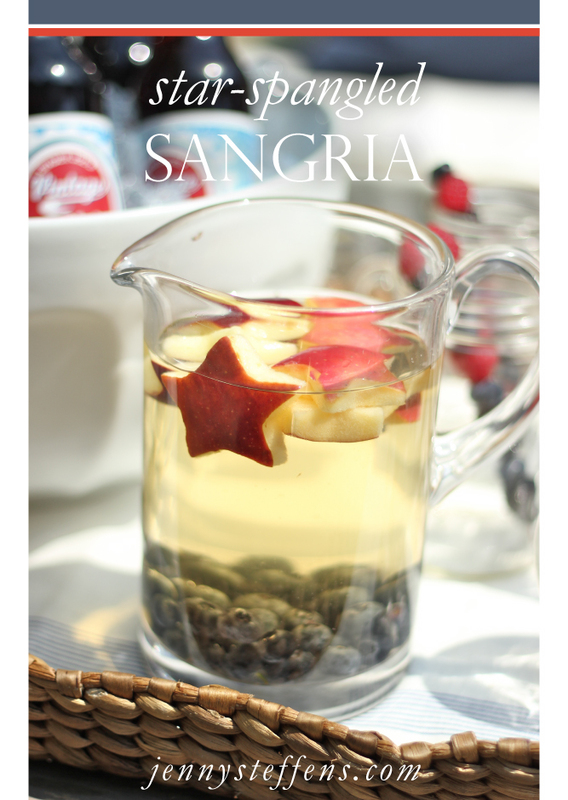 I served the Spangled Sangria in Mason Jars with Berry Skewers. Just thread red and blue berries on a wooden skewer. Not only just for looks, they work great to keep your drink nice and cold when frozen, too! Click below to continue reading after the break! I'm re-posting this from two summers ago... because I still love sliders! I asked Mike what he thought would be a good idea for a burger themed party. He said, "Call everyone before the party and ask them exactly what they'd like on their burger - customized." Hum... that seems like a lot of work - I'm not running a restaurant. I thought that making a variety of mini slider burgers would be a better way of letting everyone try some new twists on our favorite combinations. 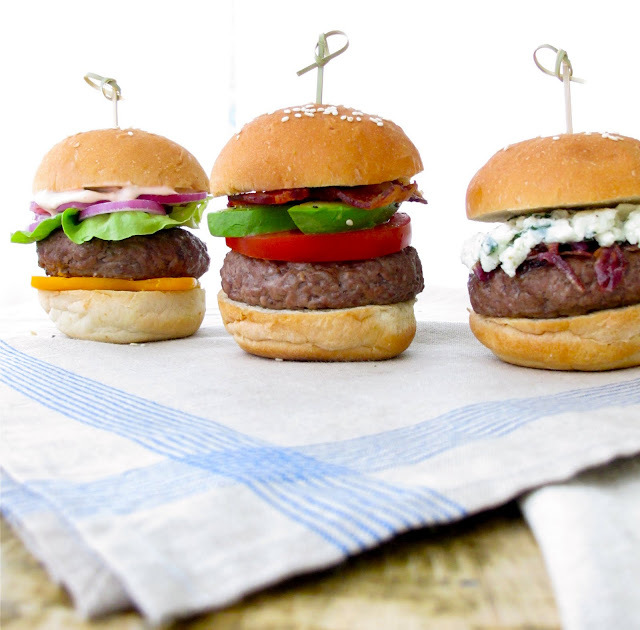 This is a great party idea for the 4th of July - a new twist on the classic grilled burger. I've made thousands of sliders in my day - literally. During my catering days, sliders had just hit the scene and every Bride and hostess wanted sliders. They were a little time consuming to make, but very budget friendly - which I loved, of course. I found that the best (and easiest...) way to make them in mass quantities is to form them with an ice cream scoop and broil them on a baking sheet in the oven, similar to meatballs. In a large bowl, combine beef, salt, pepper, mustard, steak sauce and egg with your hands. Be careful not to compact the mixture. Form 18 patties and place them on a baking sheet. Place in the oven under the broiler on high for 5-7 minutes. Remove and place the patties on buns on a clean baking sheet. Cover with foil. Keep them warm in a 250 degrees oven for up to 30 minutes. To make the party really easy, you can have everyone make their own. 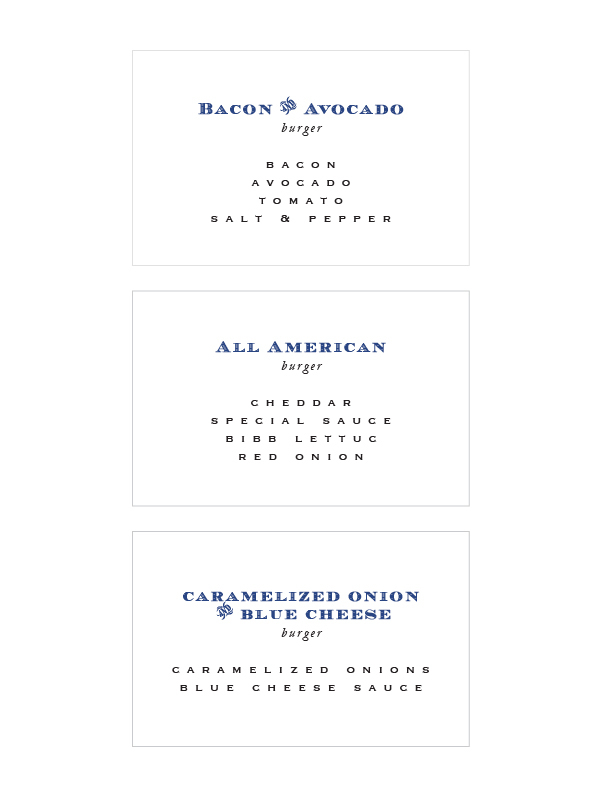 Print these signs to help your guests come up with tasty creations. Click on the image at the left to be directed to the full-sized image to print. 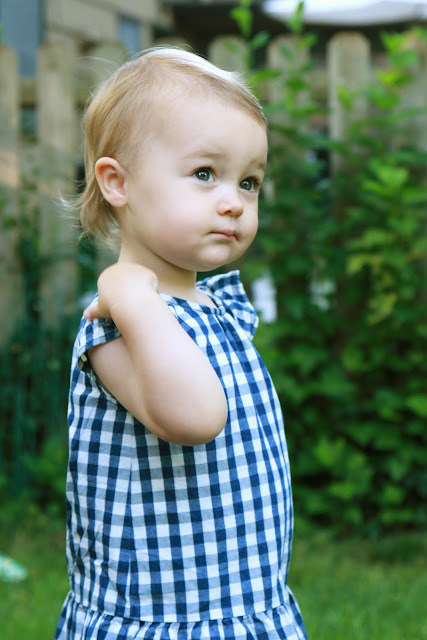 This week I'm taking a little Summer Break from blogging "work" to relax with Emma. 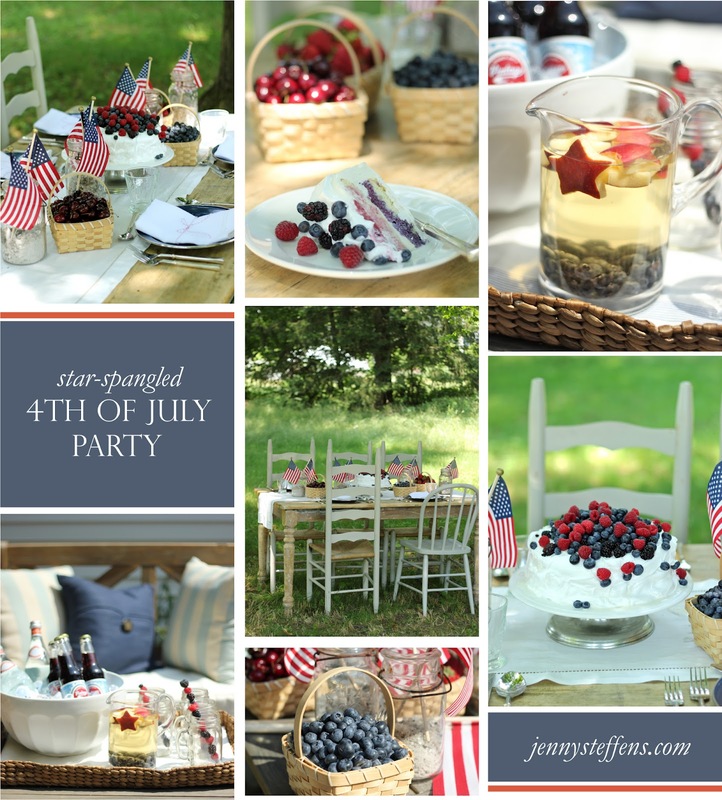 We'll be decorating the wagon for the 4th of July Parade, making some favorite summer treats and taking lots of photos. For now, I'm going to share a couple of posts from last year's celebrations... including this ice cream cake with blueberries, raspberries and blackberries. Enjoy! Begin by making the strawberry sauce and the blueberry sauce that will go in between the layers of ice cream. To make the strawberry sauce, combine 1/3 cup of sugar, 1/3 cup of water and the strawberries in a saucepan. Cook the mixture on medium until it begins to bubble. Continue cooking until the sauce has slightly thickened, for about 15 minutes. Remove from heat, transfer to a small container and chill. Repeat the same method with 1/2 pint of the blueberries to make the blueberry sauce. Place ice cream in the refrigerator for 30 minutes before you begin assembling the cake to allow it to soften slightly. Slice the cooled 8-inch round cake in half, creating two layers. Place one of the containers of ice cream in a mixer fitted with the paddle attachment. Mix until the ice cream is soft and easily scooped, but not melted, about 2-3 minutes. Scoop a third of the ice cream into the springform pan. Spread the ice cream into the bottom evenly. Work quickly so the ice cream does not melt too much. Put one layer of the cake on top of the bottom layer of ice cream. Scoop another third of the ice cream into a large piping bag. Pipe a border around the outside of the cake, creating an edge so the berry sauce does not spill out over the sides of the ice cream. Pour the blueberry sauce onto the cake slowly allowing it to soak in. Spread the last third of the ice cream on top of the blueberry layer. You may need to also use some of the second container gallon of ice cream to complete the layer. Repeat with the second layer of cake, using the strawberry sauce. 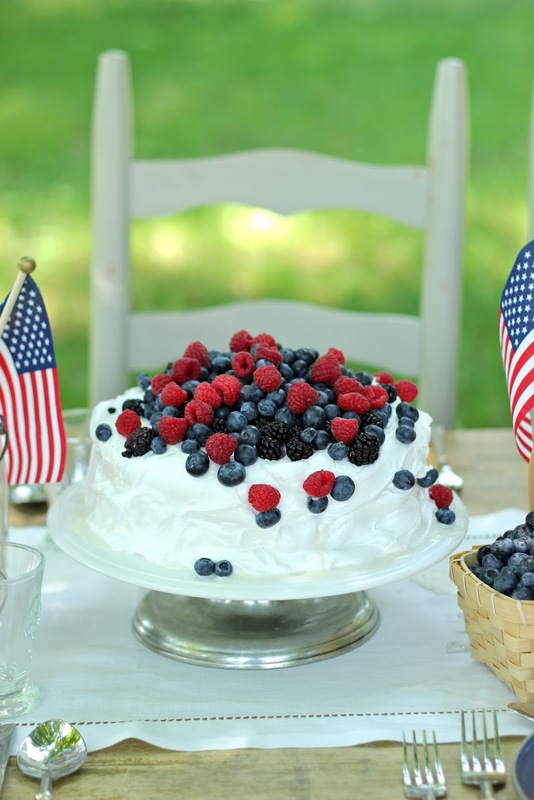 Before serving, cover the cake in a layer of Swiss meringue and top it with fresh berries. To make the meringue, begin by putting 4 egg whites into the top of a double boiler with 1 cup of sugar and a pinch of cream of tartar. Slowly heat the egg whites in the double boiler for about 5-7 minutes to melt the sugar, whisking occasionally. Rub the mixture between your fingers to see if the sugar has dissolved. When you cannot feel the sugar granules, pour the mixture into the bowl of a mixer fitted with a whisk attachment. Mix on high for 5-7 minutes until the meringue is shiny and thick. Dollop the meringue on the frozen ice cream cake and spread it over the sides. Top with fresh blackberries, blueberries and raspberries. Serve immediately or return it to the freezer. The above photo was taken after the cake sat for 45 minutes in 95 degree weather : ) It can (and should be) placed back in the freezer!